I've never heard about Chefs' Quarter. We were just a bunch of hungry people in a certain section of Megamall where a juxtaposition of restaurants stood. Large menus greeted you at each entrance and we hopped from one restaurant menu to another, trying to see if one would catch our fancy. Next up was Chefs' Quarter. 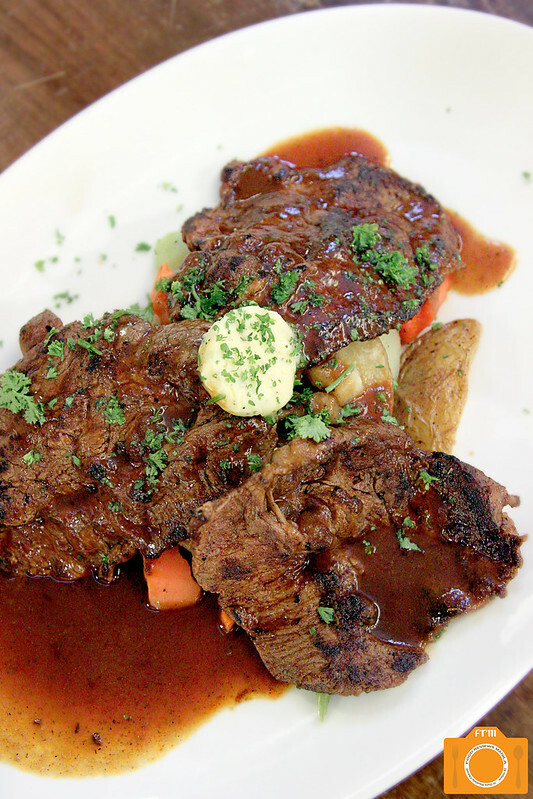 The place looks rustic and decent, a cross between fine dining and casual. 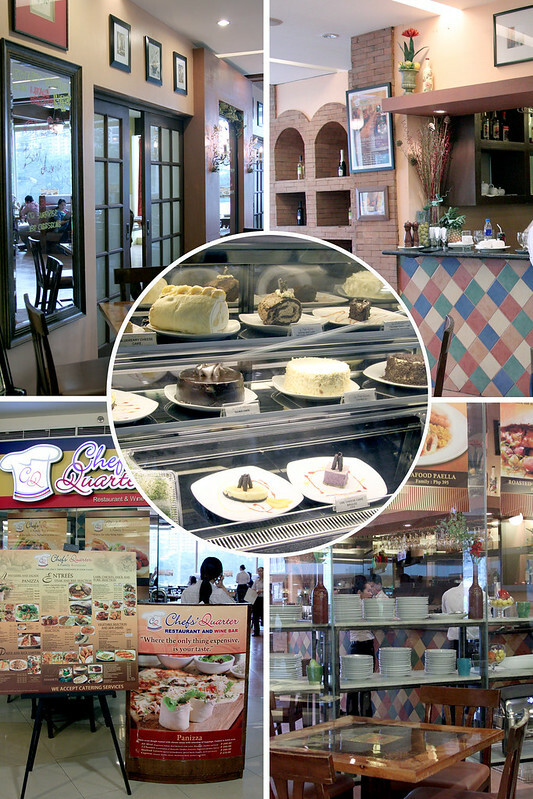 The food photos were pretty alluring and the prices very affordable. That settled it, we nestled ourselves into one of the exterior tables and proceeded with our orders. 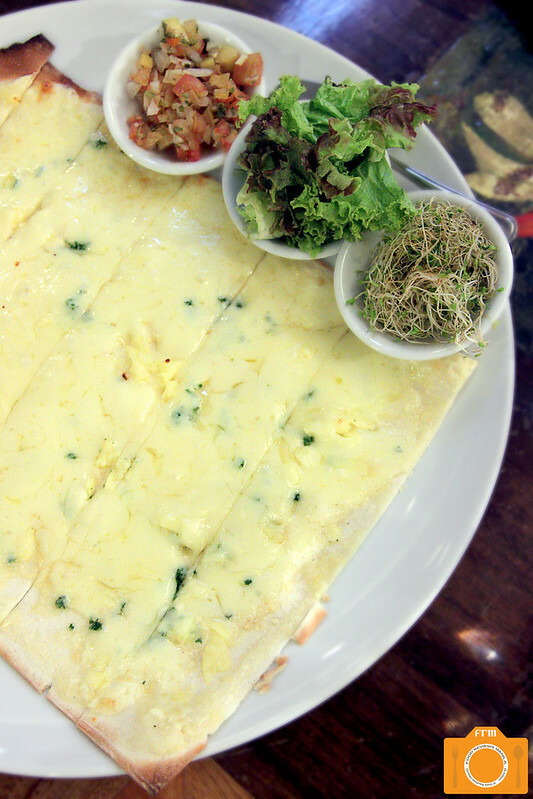 I find strips of pizza that you get to roll quite amusing so I had no second thought of getting one of their panizza dishes, the Three Cheese Panizza (P300) to be exact. The paper-thin dough was cooked in a brick oven giving it that rustic aroma and a mar of brownish burn at each corner. The dough was blessed with mozzarella, cheddar and parmesan, while three small condiment saucers carry tomato salsa, mixed greens and alfalfa sprouts on the side. I scatter some salsa on the length of a strip, added a couple of sprigs of greens and a few tufts of alfalfa before gingerly rolling the soft dough using my forefinger and middle finger, supported by my thumb. The crust was beautiful, a hint of crispness yet still bite-friendly that it doesn't poke your palate. The round of cheeses played gracefully with the acidulousness of the salsa and mild earthy taste of alfalfa. It was delightful! 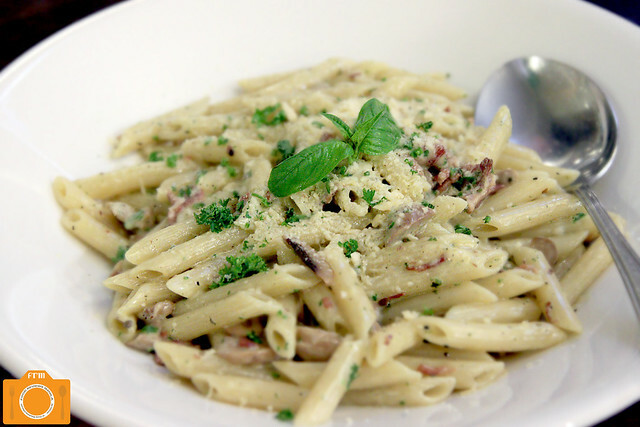 For the pasta, we opted for the Penne Carbonara (P195 solo; P395 family). The pasta wasn't necessarily swimming in white sauce yet the creaminess was evident and apparent in the speckles of sauce thinly blanketing the noodles. Grated parmesan cheese splattered about, mostly gathering at the center and covering some bits and pieces of bacon peeking here and there. I fork my way, digging for more sauce that was hidden underneath while simultaneously enjoying the classic flavors in the dish. 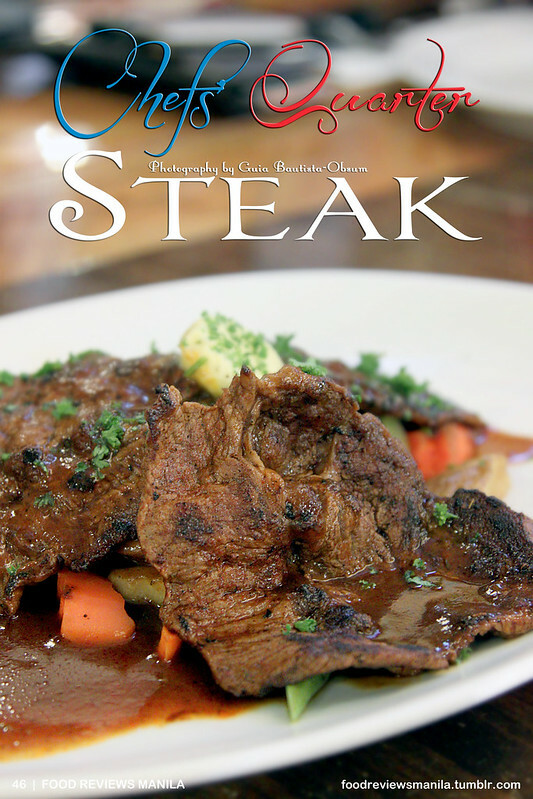 The Chefs' Quarter Steak (P295 4 oz; P595 8 oz.) was divided into three thin pieces of meat. Beneath lie slices of buttered vegetables and potato wedges. It was thin enough to make you doubt its "steakness" (if there ever was a word though I certainly believe not). When someone says steak, a thick slab of meat immediately comes to mind unless you're ordering one from a fast food place. No matter, the flavors were robust and clear, almost bordering on salinity if not for a forkful of that starchy wedge lying quietly on one side. The meat was fairly tender and I spread a bit more of that parsley garlic butter to tame the strong taste. In terms of size and taste, it was agreeably not bad at all for the price. 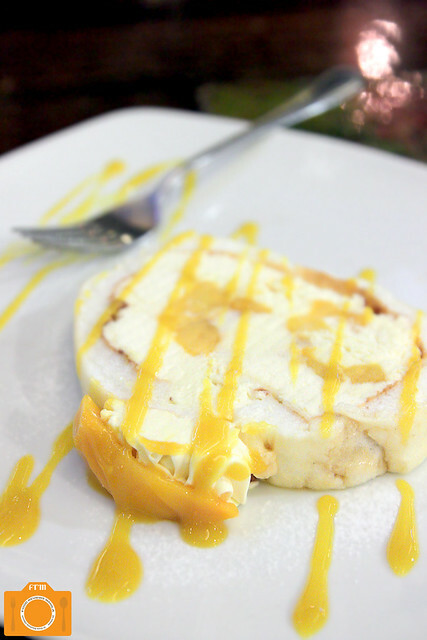 The name Mango Brazo (P70) piqued my curiosity and I order a slice for dessert. Sweet mango sauce, bright and sunny in its yellow hue, was drizzled across a slice of fluffy meringue wrapped around a slightly cold mango cake. The cream rosette topped with a sliver of fresh mango that perched on the roll, now lay peacefully on the side, tempting in its golden glory. A slice of the fork brings a rush of cool, dulcet flavors in the mouth; glad that it wasn't cloying and still retained that addicting quality a good dessert brings. 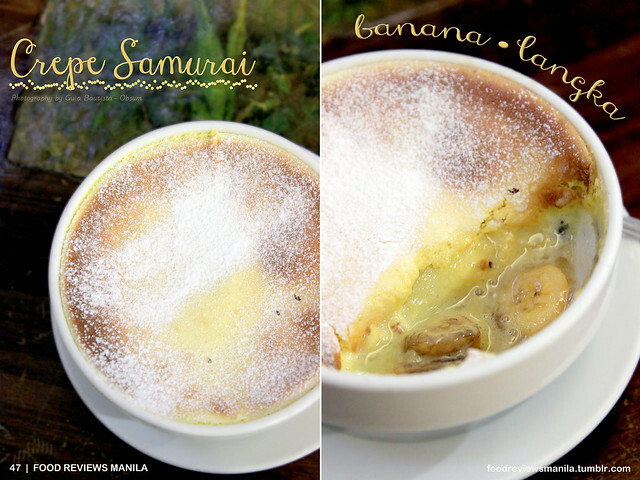 I could say the same for their Banana-Langka Crepe Samurai (P120). A bowl of crepe with brownish edges was partially covered with powdered sugar. A fork's impalement reveals slices of sweet banana and langka in a pool of saccharine pale yellow sauce. The warmness deliciously contrasted to the previous dessert and I keep going back and forth to get more of that conflicting temperature. What a way to end a very nice meal. Have you tried this? What other dishes do you think I'd fall for? Any recommendations are welcome, leave them at the comments below. A Little Breakfast Magazine Giveaway!